Hospitality is among the world’s most lucrative and sophisticated industries. Hotel design styles available to travelers range from modern high-rise luxury to modest single-unit vacation rentals and everything in between. Competition demands that hoteliers distinguish themselves not only in service and management but also in design as an extension of an overarching brand. The guest’s aesthetic experience of a space nurtures their sense of “escape” and develops their loyalty. As an essential communication tool, expert hotel design conveys the personality and mission of the company. Bear in mind, however, that creating the right experience for the guest is a delicate undertaking, particularly in large multi-unit facilities. The role of the designer. A designer’s job should not be passive. In fact, an interior designer should not be retained as a “designer” who implements tasks, but rather a “consultant” who affects high-level planning. A consultant is a strategic thinker who garners the influence and esteem of architects and brand managers. Without high-level insight, a designer may implement hotel design features inconsistent with brand standards. But a consultant who intelligently understands and interprets the strategic vision of the company will adhere to and protect guidelines that shape the brand. When to engage an interior designer. As a strategic partner, the interior designer should be brought onto the project at the very beginning. The designer sets the tone for a unique hotel brand by translating emotions into physical aesthetic. Thoughtful hotel management teams employ interior designers as a prime management tool for creating an advantage over competitors. Entryways and common areas. Highly influential on guests’ impressions, the atmosphere of the spaces first introduced to guests, such as entryways and common areas, set the tone for their stay. These spaces should evoke specific feelings set out in brand standards, like joy, serenity, or excitement, for example. Furthermore, carefully selected installments, such as one-of-a-kind artworks from local artists or water features, function as memorable icons and give guests an aesthetic touchstone to establish the setting. Shaping, color, and movement. The sense of movement in a space, much like that in a painting, is deeply influential. Elements such as indoor plants, draperies, upholstery, pillars, and moldings serve to guide guests’ eyes to vaulted ceilings, to high-impact statement pieces, and to their destinations throughout the building. Lighting. Instrumental in creating an atmosphere that conveys a brand experience, indoor lighting may be used to influence guests’ emotions, mood, and cognition. Lighting has been known to affect people psychologically. 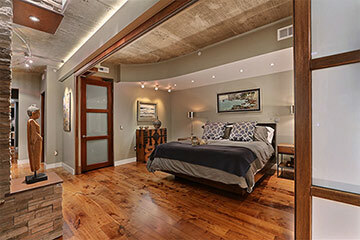 Warm, ambient lighting sets the tone for coziness and comfort while cool or natural lighting energizes a space. Strategic use of light harmonizes the guests’ experience with brand intent. Materials and textures. Design honors visual appeal, and visual appeal pays tribute to color. Warm wood tones and grain textures mirror the outdoors establishing tranquility whereas materials like marble and slate create a more cool-toned and classic air. Working from our “organic chic” aesthetic philosophy, Viridis Design Studio strategically employs natural materials and elements within contemporary design schemes, balancing spontaneity with geometry for an evocative result every time. Efficient layout. When envisioning a memorable space, environments where one is carried off into a unique world. A traveling guest, however, typically spends little time in their hotel room. Guests need efficient and unobstructed layouts, ones which enable them to remain relaxed as they prepare for their day and get out the door. From intuitive controls for showers and microwaves, to thoughtful design of easily accessed closets and storage spaces, every second counts. Updated technologies. Guests require more than just fast WiFi to stay connected. Plenty of outlet access points – preferably those with USB plugins – as well as modern devices such as Bluetooth-enabled televisions rise in priority. Other techie features may include smart mini-bars that alert the front desk when stock is low, or climate control sensors that adjust for a perfect room temperature according to a guest’s body heat. Sustainability and renewability. Guests today are more concerned than ever about their ecological footprint, and gravitate toward businesses that sympathize with their environmental consciousness. Elements that convey this include sustainably sourced woods, LED light bulbs, automatic shutoffs for overhead lights, low-flow toilets, and more. For any guest, a truly exquisite hotel will balance efficiency with beauty, and warmth with simplicity. The relationship between guest and host is mortared by subconscious impressions, and superb interior design secures this relationship. If you’re interested in conveying your unique message to your guests while using cost-effective, sustainable materials and methods, reach out to Viridis Design Studio today. Learn how atmosphere impacts restaurant interior design. Consult our expert hotel interior designers. Contact us by phone at (303) 489-9958, or by filling out our online form.